You and your neighborhood deserve the best in porter services. Don’t settle for mediocrity when you can have one of the best cleaning services in San Antonio. 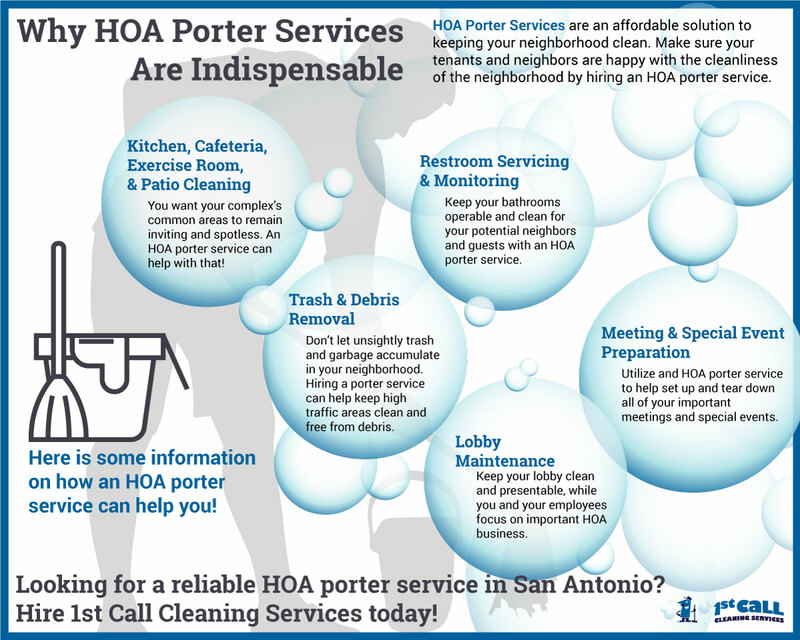 Our porter service will make sure your neighborhood will be spotless, and we will keep open lines of communication throughout the whole process. Tired Of Unreliable Porter Services? Don’t Settle For Inexperienced And Unreliable Porter Service Companies! Is your porter service doing all the tasks they agreed to or just the bare minimum? How does this reflect on you when HOA board members inspect the property? As a property manager for homeowner associations, you need a porter service that will represent you and consistently address details of your properties. Your homeowners expect nothing less. If you have noticed things like inconsistent curb lines, unclean restrooms, and litter-filled landscaping, it’s safe to say your HOA porter service providers are dropping the ball. The good news is that you don’t have to settle for these lousy services. If you are in the greater San Antonio area, give us a call! At 1st Call Cleaning Services, we are proud to offer superior porter services. We not only have the experience and expertise to handle all of your HOA services, but we also take great pride in our dependability and strive to always go above and beyond. This is, for example, why we aim to always communicate property issues and keep you ahead of the curve with HOA board members. Also, we know that our porter services ultimately reflect on you, and this is why we always strive to represent you well in front of homeowners. All of our employees have been thoroughly vetted and background-checked, and we will never hire third-party contractors. On top of this, when you partner with us, you will never be asked to sign a contract or service agreement! Ready to schedule our porter services? Get your free trial! That’s right—we will provide our porter service at no charge for 14 days. No strings attached. Schedule your 14-Day Free Trial!